Hello, Mommies! I am back to blogging after a long hiatus on this blog (thank you for waiting for me, I sounded like a celebrity, haha!). This time, I will present here an event for all mothers, whether you are an expectant mom, a newbie mom or a seasoned mom. You're going to love all the activities at Expo Mom 2016 here in Cagayan de Oro. 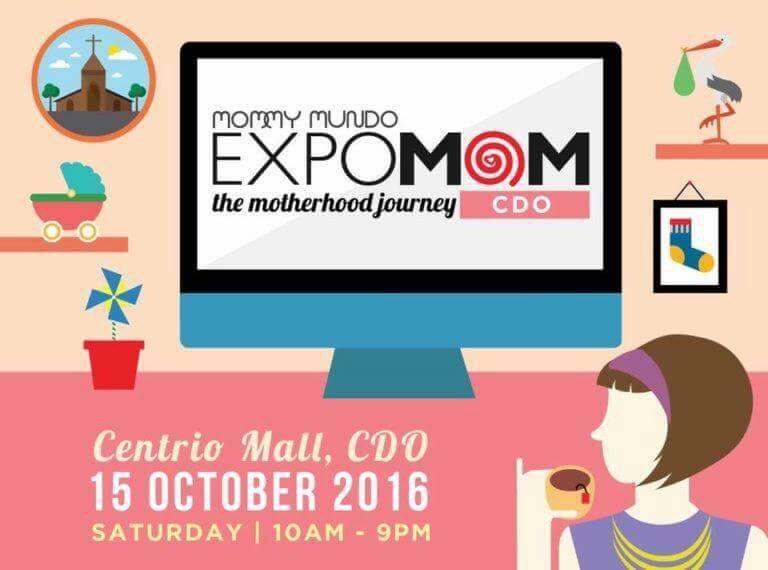 As the ultimate mommy event of the season takes a second trip to Mindanao, expect to be inspired by the different faces of mommyhood on October 15, 2016, at Centrio Mall, from 10AM to 9PM. Expo Mom: The Motherhood Journey features a fun and fulfilling all-day program. In the morning The Modern Nanays of Mindanao, a community of moms who promote breastfeeding, babywearing, and cloth diapering, lead the celebration of motherhood with a Mamba session — a Zumba class made especially for moms with slings! Dr. Raissa Paje Bayawa, founder of Happy Heart Kids Yoga, takes the stage next to enlighten moms about the benefits of prenatal yoga and to share some helpful moves as well. Two sessions delve deep into the amazing journey that all moms share. The first one focuses on pregnancy and breastfeeding & finding that right balance between home life & career. Guests are Nadine Casino, founder of Modern Nanays of Mindanao & Ruby Caberte a popular blogger (and the current President of CDO Bloggers) who is also a mom. The second touches on baby care with discussions on the right way to wear baby and age-appropriate toys to help with a child's development . Guests for this segment will be an early childhood educator and a few mommies. The other exciting activities scheduled include a bento-making session specifically devoted to picky eaters by the pioneering Bento Mommas, who have actually been with us all over the country this year! You can sign up to participate at bit.ly/bentomommasCDO for Php900, inclusive of basic bento tool kit, bento box and food ingredients for the workshop plus freebies from sponsors, all of which you can take home afterwards. A makeup on the go demonstration for busy mothers by Paola Paladio- Ching follows in the afternoon, and a craft workshop with a homegrown moms and kids crafts group. In between, many prizes will be given away care of our generous exhibitors and sponsors Caltrate and Belo Baby. 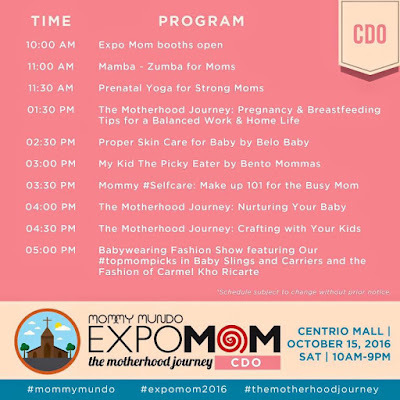 Expo Mom 2016: The Motherhood Journey is co-presented by Caltrate Plus and Belo Baby with Centrio Mall and Ayala Malls as its venue partner, supported by Modern Nanays of Mindanao, Carmel Kho Ricarte and Moms Radio, and Professional Organizers Unlimited, Inc. and Creative Juice Communications are its logistics partners. Entrance to Expo Mom is free. Below is the image for the Expo Mom 2016 list of activities.